Lokantas are the places where workers go to grab lunch, where shoppers stop for a break, where travellers get a good meal before embarking on mammoth intercity bus journeys, and where drivers go to take a rest and refuel (in a foodie way) before they continue on the road. And, often, joy of joys, these places are open 24 hours and you’re guaranteed a good hot meal, whatever the time of day. On a main road in Fethiye, backing onto the sanayi and facing the town’s otogar is a row of institutions; 24-hour lokantas that have been there for as long as we can remember. Over the years, we’ve wandered into all of them at random hours of the day. We’ve stopped off for lunch. We’ve had the pre-intercity bus journey meals. And, yes, we’ve entered those premises at 4 and 5am to eat soup after a night out on the pop. It’s what you do. And it’s what others do, too. These lokantas are rarely empty. Of the lokantas in this area, Seçkin Restaurant has become more of a regular for us. Creatures of habit, you get to know the staff. And, should you feel the urge, you can also get a beer here, too. More often than not, these days, we go here for a late lunch so a glass of water wins the day. It’s the feast of food you come to Fethiye’s Seçkin Restaurant for. These large 24-hour lokantas that exist to serve Turkey’s working public have all manner of food available and rarely a menu. Seçkin Restaurant has a ‘rough guide’ menu on its tables but you don’t need it. You’ll see all their food types listed outside. And then you’ll also see the bain marie packed with trays of tempting Turkish dishes. Oh, these bain maries…this is where we always get over-excited. Any good Turkish lokanta will have staple dishes in the bain marie, waiting to be served up and devoured by hungry customers. The sanayi, mentioned above, is a town’s industrial area. Seçkin Restaurant and the other lokantas feed mechanics, welders, joiners…and all the people like us, too. We come here if we go to Erasta Shopping Centre. Erasta has eating places, but lokanta food is too good to pass up! Staples of the bain marie are pilav (either rice or a bulgur pilavı version – or both), roasted vegetables to be topped – if you want – with natural yoghurt, braised spinach, seasonal vegetables such as okra in tomatoes and olive oil, chickpea and bean dishes such as kuru fasulye. And then there are the daily dishes – different every time you go. Such a treat to wander into a lokanta having no idea what traditional dishes are going to be looking back at you. Small lokantas like the fab Yeşil Asma Yaprağı in the centre of Fethiye will have just a few delicious choices – but Seçkin Restaurant is huge, with a bain marie to match. Where to start? The waiter at Seçkin Restaurant stands by the side of you, pointing out each dish and describing what’s in each. Sometimes we recognise the dish, others are new territory. We choose one main meat dish each and then we have to go the pilav route. Oh and some yoghurt-topped spinach. Oh and some roasted vegetables, too. You can see from our photos of our last three visits – we’re appreciators of lokanta food and we order way too much. All meals at Seçkin Retaurant are also served with chunky, warm, homemade pide bread, a side salad and, often, a side plate of whole fresh chillies and lemon wedges. The chillies are never for the feint-hearted but we can’t resist munching on a couple. And, if choosing foods from the bain marie is not your thing, Seçkin Restaurant is more than a lokanta. They also have a bread oven so you can choose from a variety of pide, they have döner kebabı and Iskender, or you can get grilled foods like şiş kebab, too. And of course, a choice of soups is also available. Each time we go to Seçkin Restaurant in Fethiye, I tell myself I’ll have soup and pide, soup and pide, soup and pide. And then we walk inside and there’s the bain marie. Apart from early hours soup after a night out, not once have I succeeded in avoiding the bain marie. When you visit Fethiye, and anywhere else in Turkey for that matter, all of those traditional Turkish soups, stews and vegetable dishes you see on recipe websites, those are the dishes you’re going to see in a lokanta and in Fethiye, Seçkin Restaurant certainly has no shortage of choice for you to sample. Seçkin is a common name in Turkey and you will find a few restaurants and lokantas with that name. This Seçkin Restaurant is on Ölüdeniz Caddesi in Taşyaka. 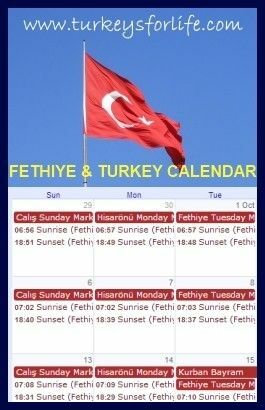 Ölüdeniz Caddesi is the road that also has Erasta AVM and Fethiye otogar on it. Seçkin Restaurant is open 24 hours, daily, serving hot food. As well as lokanta foods from the bain marie, there are soups, pide, kebabs and grills available, too. Lokantas generally serve pre-prepared traditional Turkish dishes to workers so are very reasonably priced. Seçkin Restaurant is a great place to eat if you’re in Turkey on a budget. Seçkin Restaurant is just one of many places to eat and drink in Fethiye. 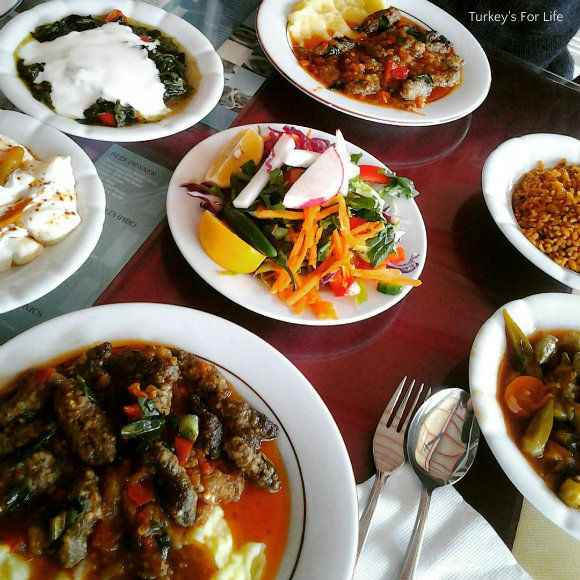 If you find a place that does good kuru fasulye you can usually bet that everything else on the menu is great too. My lack of Turkish always deters me from using Lokantas but I note that this one has a menu with English translation – maybe give it a go this Spring. I’ve been to many of those intercity bus journey places in the middle of the night, but never really thought of having more than sweet tea and simit. Can’t imagine why. Your photos have really made my mouth water.